All Web addresses mentioned were functional as of 2-17-17. From the Cumberland Gap to the Atlantic Ocean, this is Virginia Water Radio for the week of February 20, 2017. This week, we feature another series of mystery sounds. Have a listen for about 35 seconds, and see if you can guess what’s going on with this music, screams, and water splashing. And here’s a hint: When a good cause needs help, lots of people plunge right in. If you guessed, excited people running into near-freezing water, you’re right! But the real mystery is: why did over 200 people jump into the cold New River one day in January 2011? 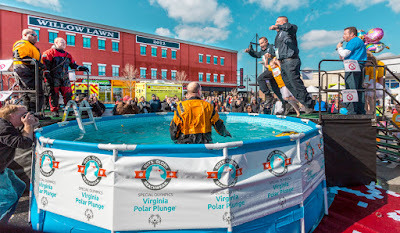 They were Radford, Va., participants in the Polar Plunge®, held annually to raise money for Special Olympics, the international organization dedicated to sports for people with intellectual disabilities. At winter water plunges around Virginia and across the country, the charity gets contributions from entry fees and from donations raised by plunging participants. The 2017 plunges in Virginia were scheduled for February 4 into the Atlantic Ocean at Virginia Beach; February 18, into the New River at Radford; February 25, into the Potomac River in Prince William County; also February 25, into an above-ground pool in Richmond; and March 11, into a pool in Charlottesville. Information about these events is available online at polarplunge.com. If you’ve got thick skin, plus a warm heart for a good cause, you could be heading for a plunge! Thanks to this week’s co-host, Eryn Turney, the spring 2017 intern at the Virginia Water Resources Research Center. The sounds in this episode were recorded by Virginia Water Radio at the Special Olympics Polar Plunge into the New River at Bisset Park in Radford, Va., on January 29, 2011. This episode is an update of Episode 96 (1-23-12), which has been archived. Above: Special Olympics Virginia Polar Plunge in Richmond in 2016. Photo by Willow Lawn (a Richmond commercial area operated by Federal Realty Investment Trust), courtesy of Nicole Rappaport, Virginia Special Olympics, used with permission. Four photos above: Special Olympics Virginia Polar Plunge in Radford, February 18, 2017. Top: chute participants use to run into the New River. Upper middle: Emergency services personnel at the ready in the water. Lower middle: Participants just before their plunge. Bottom: Blue Brother impersonator, post-plunge. For photos from the Virginia Beach Polar Plunge on February 4, 2017, please see this WTKR TV-Norfolk link. The year 2017 marks the 25th anniversary of Virginia Special Olympics polar plunges. The funds raise help the Virginia organization provide training, competition, leadership, and health services to over 27,000 athletes. Special Olympics International estimates that 200 million people worldwide have intellectual disabilities. Sources: Virginia Special Olympics Polar Plunge Web site, http://polarplunge.com/; Special Olympics, “What We Do,” online at http://www.specialolympics.org/Sections/What_We_Do/What_We_Do.aspx. Keith Hagarty, “Highlander Polar Plunge Makes a Big Splash for Special Olympics,” Radford University News Release, 1/29/11, online at http://www.radford.edu/content/radfordcore/home/news/releases/2011/01/polar-plunge-2011.html. Special Olympics, online at http://www.specialolympics.org/. Special Olympics in Virginia, online at http://www.specialolympicsva.org/. Virginia Special Olympics Polar Plunge, online at http://polarplunge.com/. For another episode on a winter-time plunge into the New River, focusing on the heat-absorbing properties of water, please see Episode 195 (1-6-14): Wading into the New Year, the New River, and Water Thermodynamics. PH.7 – energy transfer, transformations, and capacity to do work.